What better way to end a work week then sitting at a downtown Miami bar with CEO, @Ed Tang, and his Avegant Glyph on my noggin. As it was fresh from winning CES’s Best of Show award. But it wasn’t the Glyph that really blew me away it was his iPhone5. Why? Because when demoing the Glyph wearable, it was hooked up to his iPhone5 and I couldn’t help but stare at the unopened Kickstarter app icon, with all 1,843,200 pixels. If I clicked that app, then on their first day, I would of saw that in only 4 hours they hit their Kickstarter goal and it was climbing around $600,000. Currently, just a few days later, this campaign is at $803,109 and not stopping. If you want to validate any piece of tech hardware or wearable what better way? This is a huge accomplishment for any startup, it funds innovation and says “yeah you’re on to something”. The lean startup gods are smiling. It was a two part hands on test. One Glyph was on an iPhone the other hooked up to a laptop. Second, was a laptop with 3D movie of a jellyfish. As an avid scuba diver I can say it was semi-realistic without that whole stinging thing Im used to. But since Im antifun and brag about not owning a TV (not a gamer or a movie buff) I didn’t really take this test to heart. So I would recommend checking out experts in those field’s blogs for exacts. More in video below, Ed can tell you. Security in 2 ways. 1)No one knows what Im doing 2)No data on device. It can be used as headphone, visual or both. Like the video below, lets talk how a business or enterprise can use Glyph and wearable apps. This isn’t just a gaming “toy” or device for movies on the go. The Avegant Glyph brings a powerful security tool to business travelers. More and more “over the shoulder attacks” are happening. We all know someone at the big 3 accounting firms for example. I assure you their laptops have a protective blurred film to prevent side viewing. But that wont stop Mr. Competitor that is sitting behind you on a plane.What surprised me is many Silicon Valley companies are starting a no airplane working rule due to this. Wasted work time on planes, doesn’t help your enterprise..unless you work for SkyMall Magazine! Enter Lightbulb, Stage Left. It hit me! After picturing myself editing spreadsheets on this in HD, I realized as soon as you unplug your source (laptop, tablet, phone, etc) it simply becomes a pair of headphones. We all know in the enterprise world, one lost device or MDM failure could mean leaked info and bad headlines. 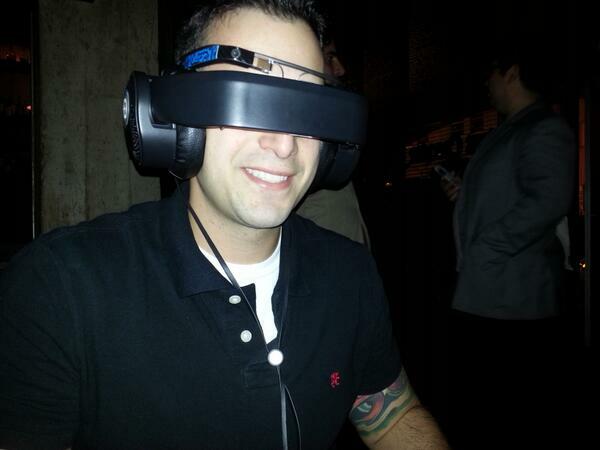 Since no data stored on the Avegant Glyph, no MDM required. I wish that light bulb was above my head for the way too dark video below. Big shout out to the Avegant team and our local Google Glass Explorer group that backed me up.